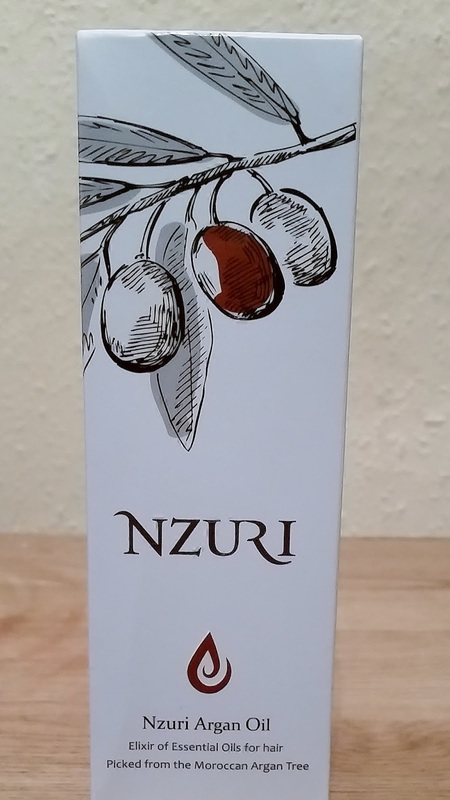 Nzuri Moroccan Argan Oil - Suitable For All Hair Types. Nzuri Moroccan Argan Oil is an elixir of essential oils for hair. I am a huge fan of hair oils and use them quite a lot to put nourishment and moisture back into hair that have been coloured or heat styled a lot. What is great about these hair oils now is that they can be used as a heat protectant to protect your hair from the heat from your favourite hair dryer or straightener. I haven't really heard of the Nzuri brand before but as i got a discount to purchase this product, i thought why not? The product comes in a white box with some great information to tell you how you will benefit by using this product to how to use. 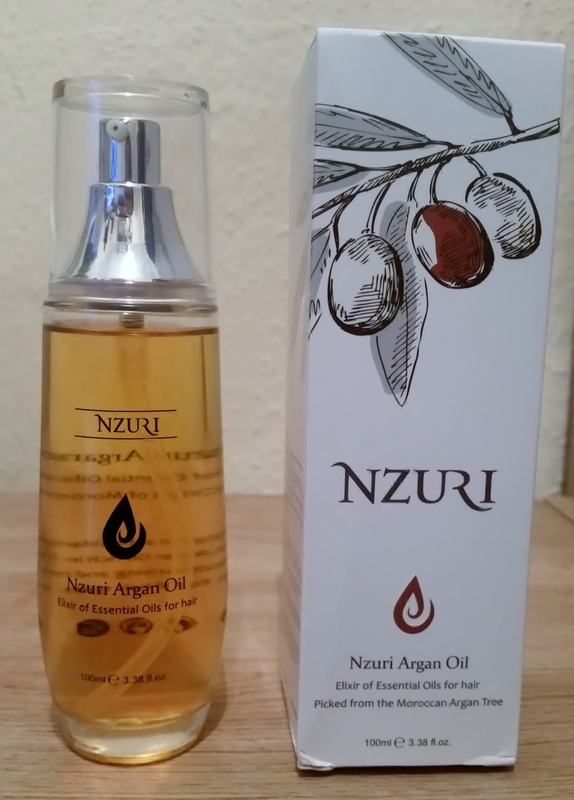 This powerful blend of nutrient rich Argan Oil from Morocco is naturally high in anti-oxidants. It can significantly improve hair condition, texture and protects from split ends, frizz and dryness. The Elixir not only nourishes hair follicles but also revives the quality of your hair. Nzuri Argan Oil can be applied to your hair at any time. 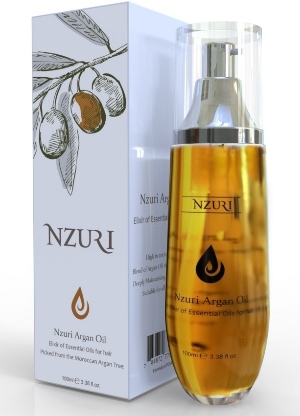 To control split ends and nourish your hair, massage Nzuri Argan Oil Elixir directly to your scalp and leave to condition for 30 minutes before shampooing. For shine and heat protection apply a few drops to towel dried hair. For smoothness and defrizz apply to dry hair after styling. The 100ml glass bottle with its silver tone pump dispenser looks great and sets itself apart from any another hair oil bottle. The pump dispenser dispenses just the right amount for you to use and if it isn't enough u can dispense some more. I really like this as i have used pumps on other bottles that have dispensed way too much product in my hand and I'm left thinking what do i do with that? I cant use all of that product on my hair. You wont get that with this product! 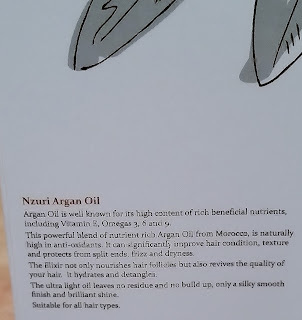 The Argan Oil has a pleasant light sweet fragrance to it that isn't overwhelming but very calming and relaxing which i find really, really nice. Once applied to hair this light weight oil is instantly absorbed and makes styling easier and cuts down drying time. My hair felt instantly smoother and moisturised but also had a bounce to it which surprised me on how well this oil doesn't and wont weigh your hair down. My hair appeared more healthier and with a natural shine and generally is behaving!! 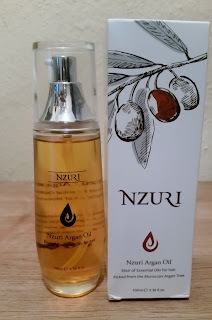 I'm really glad i came across this product and tried it because by using this product, i now realise that some other oils i was using were not that good, compared to this one! So if you are looking for a product to whip your hair back into health and shape, you have to try this one! X Neal.